I’m putting this here mainly to keep track of it. I like the idea of time travel as a game, maybe like a scavenger hunt, but I’ve got too many other projects going to sufficiently develop this one now. When I was a kid, I loved all of those Irwin Allen television shows such as Lost in Space and Voyage to the Bottom of the Sea. The Time Tunnel (1966-67) was high up on my list, even if it only made it two seasons. As an adult, I find all of Allen’s shows to be excessively cheesy, but I can tolerate some limited exposure. I do periodically re-watch the Time Tunnel’s pilot episode Rendezvous with Yesterday, which introduces how our heroes get stuck jumping from one part of past and future history to another, and probably where a significant portion of the special effects budget was blown. I’ve even tried my hand at writing my own Time Tunnel story, but I used it to resolve a conflict within one of the main characters and sent him back home at the end of the tale. So imagine my surprise when I discovered there was a board game based on the show. It was probably a bad board game, and its only attraction was in exploiting the show’s popularity with pre-pubescent boys. But like I said, the idea of time travel as a game or contest is really interesting to me, so I’m just going to park this here. 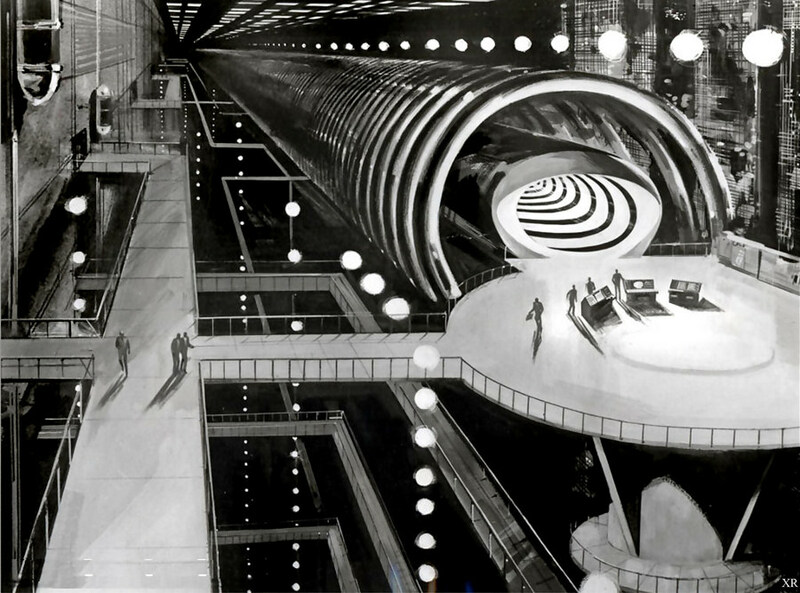 Concept art for the 1966 television show “The Time Tunnel”. One of the worst exploitative boardgames ever was Trump: the Game. I like the idea of time travel as a game as well. Something snotty rich kids of the future do to mess with people of the past. Great concept. Thanks. I was thinking of people being forced into playing the game by a powerful time traveler. Winner saves his family, losers all die. I still need to work on it. Do we really need another story about a sociopath torturing some group of hostages? Actually, I haven’t started thinking about how it would go, so there’s no need to fret at this point. That brings up the interesting question: Is history fixed – as in I tried to kill Hitler, but he survived and WWII still happens – or fluid ala Quantum Leap? Or do you take the approach used in Dr. Who: there are fixed points, but others can be altered. Me, as much as I enjoy QL and early Who, I think History is fixed. Perhaps a travel can observed, but nothing he does can alter what has been. And then there is the “butterfly effect” view, where the minutest change cascades into incalculable amounts of alteration to the intricate processes which shaped a given timeline. We need not exaggerate such cascading effects, because normal causalities should control them, therefore we might expect that some effects may be very localized while others could have far-reaching impact. Of course, if the universe is not a completely closed mechanical system, but may respond to inputs from outside the system, then it is possible that Someone outside it may observe and act to counter a cascading change which might alter a predetermined Plan or certain specific events. In this view, some events would remain fixed in their essentials because of deliberate efforts to preserve them. I’ve always wondered if God could/would/should change history. But then again, from Hashem’s perspective, the universe is coming into being, is in a state of being, has passed from being since He transcends timespace. Also, if there were a butterfly effect and history changed, would anyone notice? If no one does, it probably isn’t a good story. The writings of the Hebrew Prophets imply that HaShem has an overall Plan, by which He has been exerting influence all along to guide its accomplishment. How much influence is a matter of some indeterminacy. Hence a time-travel story in which humans endeavor to change something that had been already accomplished, supposedly in some degree of accordance with the master plan, should expect their actions to provoke a response to inhibit them or to ensure somehow that any changes or adjustments they make will result in a timeline that is still in conformity with the essentials of that Plan. Such a story must explore the envelope of “free will” and the “dominion” that HaShem accorded to humans in order for them to accomplish their original assignment to “tend the Garden”. Since nothing can escape the notice and attention of the Omniscient Creator, one must assume that He “saw” in advance what the time-travelers would try to do and evaluated what should be the limits of the change they could accomplish, also setting the stage for it and “stacking the deck” to ensure that its outcome would be acceptable vis-à-vis the Plan. The interplay and potential tension between the desired human action and the master Plan could make for quite a story. I once spoke to a fellow (you’d know his name if I mentioned it) who at least implied that there is more than one specific path through history that will still produce the ultimate result in Hashem’s plan, so I would think within those limits, changing history is possible, though perhaps somewhat difficult. I’ve been pondering my time travel game and one thing that occurred to me would be a scavenger hunt with two possible objects for the hunt. One would be that the players would come back from history with a specific object but would then return it to the exact moment they removed it so history wouldn’t change. The other idea is that they’d come back with information, such as the exact date and time that Yeshua expired or left the tomb upon resurrection, since we don’t know those details. Unfortunately, since all players would have an equal ability to time travel, there’s no thrill or drama in such a game, so I have to ponder further. How could you have winners or losers? Also, naturally there has to be an accident or some unforeseen occurrence that makes writing such a story worthwhile. Determining winners and losers requires first determining what skill or skills this game is to contest. If the skill is the accurate retrieval of information, then someone must first obtain valid data that enables the contest judges to verify the results obtained by contestants. Note that in time travel contests, one cannot win by being the first one to return with the correct answer, because the travelers can each return to precisely the same hour and second to present their results, no matter how long they must work to obtain them. Hence the results must be evaluated by such characteristics as accuracy of details, comprehensiveness, depth of historical insight. This could be particularly determinative if the amount of time that could be spent in the past were somehow limited and fixed, so that ingenuity about choosing locations and vantage points and contacts in the past would affect the quality of results. There’s a reason time travel isn’t possible in real life. Time travel stories are all really posing the question, “What if,” but then I suppose you could say that about speculative fiction in general. yeah, I used to love to watch those shows when I was a kid. Plus I recently watched all the seasons of Lost in Space on Netflix. I may do the same with the others…. I came up with in interesting idea for this game that involves another old TV show and a Hollywood mystery that goes back 60 years. It’ll take a ton of research to develop though. My response — Just curious: Why would the game have no interest to girls? A good question. Probably a poor choice of words on my part, since I was a 12-year-old boy when the show was on the air. Fair enough, I was just curious. no big.